Amitabh Bachchan acted in Ajooba in 1991 (almost 22 years after his debut) and that, along with other misfires, marked the end of his thriving career as a superstar. Almost 20 years after his debut (Raju Ban Gaya Gentleman – 1992) Shahrukh Khan made and acted in Ra.one. Has his expiry date arrived? This must be put in the context of his contemporaries. Salman Khan is 22 years into his now resurging career and going from strength to strength at the box office, mostly thanks to remakes of films already highly popular in regional languages (Dabangg being the sole exception). The other Khan, Aamir, is in his 23rd year and also going from strength to strength at the box office, with films alternating between the mindless and the message laden. The Indian film industry is heavily box office focused, and caters to a diverse audience that ranges from highly erudite to completely uninformed about film appreciation. The most successful model is to make a film filled with content that will please crowds in the A, B and C centers, but few films mange to do that. The trick is to please the erudite with content, and not alienate the uninformed with highbrow content. Most genres that work well are romcoms, slapstick comedies, or action that has already tested the waters in regional cinema. Romance and slapstick comedy are always safe bets for mostly uneducated mass audience appeal. Unexplored, or less explored are the genres of fantasy and SciFi. These less tried genres genres are beginning to crop up recently in Indian cinema. Fantasy has been propelled by the phenomenal success of Magadheera, but the recent 7 Aum Arivu suggests that the waters are as yet uncharted. 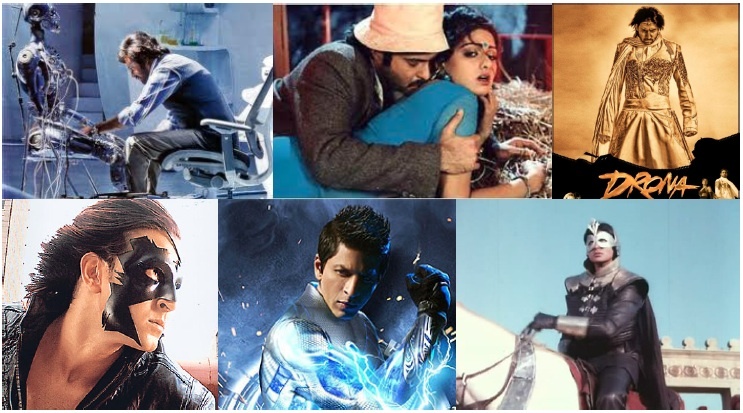 The SciFi genre is untested except for Mr. Bachchan’s Ajooba (a box office failure), Mr. India (a superhero with limited bells and whistles, a romcom in content), and Hrithik Roshan’s Krrish. In 2006 Krrish made about 70 crores nett and was successful. This was followed by a disastrous Drona (a film I badly wanted to work), and a questionable outcome for Robot (Enthiran is another story!). If reports are to be believed, then a year after Krrish Shahrukh Khan began to plan his SciFi superhero adventure on a grand scale. One has to acknowledge that it takes guts to plan a 100 cr plus film at a time when the genre had been tested in a limited way and no film had made more than 80 crores at the box office. Today social media and the blogosphere is atwitter with comparisons between Bodyguard and Ra.one and how Ra.one was a bigger budget film, with more prints and should have done much better (as if wide releases of a film guarantee box office success). It seems interesting that such comparisons are genre blind. Bodyguard was a tested and tried action formula, starring a superstar who has become a specialist in such, and can churn out two a year. Perhaps this will continue as long as there are Tamil and Telugu blockbusters waiting to be remade. Will these highly successful movies push cinema in India ahead in any way? I have yet to see any argument on the positive side. Why do audiences and reviewers in India fixate on the budget and the box office? Does this lead to better films? I would argue that this leads to lazy derivative film-making with a risk averse mindset prevailing. While the Indian film industry may take a step forward with a Drona and a Ra.one, it is certainly treading water or worse with Bodyguard. What do our films need urgently? They need better “scripts” (something every viewer on Twitter seems to be an expert on! ), they need better technical know-how, and they need to forge a path that is NOT highly derivative. Theoretically each genre of film has a certain audience. This determines what it will garner at the box office. But should that determine what the cost outlay should be in making it? Could any of the niche but delightful films be made at all if such a restraint was put on their budget? Coming to Ra.one, could be made on a lesser budget? Most certainly. Would that make it better? I doubt that anyone can argue that. Perhaps the producers were well aware of this dilemma and raced to do many commercial tie-ups to shave off the expenses while still not compromising on the quality of the visuals they wanted to show. If sumptuous visuals were the aim, the makers gambled boldly, and their film achieved that. That is in itself a success. What is disappointing to the fans (and reviewers) is the lack of a coherent story. With some trepidation I will insert a recent sumptuous visual feast into the equation. Avatar was the most visually stunning film in recent memory. Can anyone say the same about the story? So where does that leave us? I think a leap forward was made, and the initial prototype developed. Prototypes are always phenomenally expensive, and usually flawed. But they do help iron out the kinks and then subsequent production is cheap. So I say that Ra.2 should be made. Now that the visuals ate taken care of, time to take care of the story and produce something that will have wider appeal and more coherence. A lesson can be learnt from the Harry Potter franchise. The first book was extremely childish, and aimed to draw in all those 8 year olds who were learning to read with Harry. Then the subsequent films grew darker and bolder in content, but the 8 year olds came along, this was their series. If the final scene is anything to go by, the stage is set for Ra.2 to have a completely different twist. If the good one incorporates within him the essence of the evil one, what do we get? A darker and more twisted tale ensues. I am a SciFi fan and found much to like in Drona, and lot more to like in Ra.1. Yes it was childish, and not many appreciated that, but what are superheroes if not the product of our childish fantasies? A superhero who obeys every command of the child he was created to protect was the premise of Ra.1. It was endearing, childish, and fun. Waiting for the reboot. “Avatar was the most visually stunning film in recent memory. Can anyone say the same about the story?” More confirmation that I did the right thing by avoiding Ra.One – Avatar was AWFUL, beyond my limited ability to describe. I would have gone insane through that hideous turd if I hadn’t been able to tweet and Facebook about it throughout it’s six-month runtime. So thank you for making this parallel and reassuring me that I was right to avoid putting myself through that again with Ra.One, drop-dead gorgeous Bebo notwitshtanding. You were right to give this a miss if SciFi/Fantasy is not your genre of choice. Of all the films I listed, perhaps Drona was the most significant in terms of creating a desi superhero rooted in mythology. I wish it had been good enough and had worked for the audiences. Strange! As a scientist I found Avatar’s science to be the most carefully detailed I have ever encountered in the movies. It most approached science, otherwise all science fiction is usually post-apocalyptic fantasy. You forget Shahenshah, Most successful and Hyped movie of its time, Yes arguably Shahenshah was not super hero, but he was neither common man .. so we can put this movie in this category.